Denis McDonough, former chief of staff to President Barack Obama, has been named an executive fellow of the Global Policy Initiative in the new Keough School of Global Affairs at the University of Notre Dame. McDonough will serve as an instructor for the Keough School’s global policy seminar, teaching the inaugural cohort of 38 graduate students in the new Master of Global Affairs program. 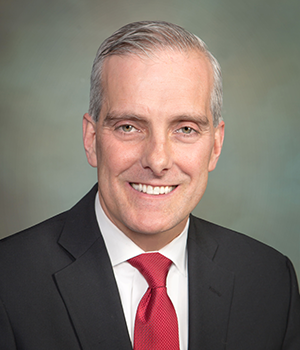 “Denis McDonough brings to Notre Dame an encyclopedic knowledge of international and domestic affairs, tested and deepened by more than a decade of experience at the highest level of government,” said Scott Appleby, the Marilyn Keough Dean of the Keough School. “His insights into the most pressing issues facing our world, and his thoughtful approach to ethical dilemmas, make him an ideal exemplar and teacher of public policy for Notre Dame and the Keough School." McDonough was appointed chief of staff in January 2013 and served throughout President Obama’s second term. He previously held several positions in the National Security Council, including deputy national security adviser. It was in that role that he was among the small group joining Obama in the White House Situation Room on May 1, 2011, monitoring the progress of the Navy SEAL raid on Osama bin Laden’s compound in Pakistan. “Given the dynamism in the international system, it is vital we train a new generation of foreign policy and international development experts,” McDonough said. Notre Dame’s Keough School is perfectly positioned to ensure those professionals are prepared to lead toward a more just and stable world." The Keough School of Global Affairs — founded in 2014 as Notre Dame’s first new degree-granting school or college in nearly a century — prepares new generations of students for skilled, effective and ethical global professional leadership. The School’s Global Policy Initiative was founded to create new opportunities for engagement with policymaking institutions and programs in Washington, D.C., and around the world. Originally published by Renée LaReau at news.nd.edu on August 21, 2017.